Friend: “My parents transfer photos from phone to PC by posting to Facebook on the phone, saving in Chrome on PC, then delete from FB.” Um. Motherf***er you’re watching a movie on a 4 ounce plate of glass. Video Game Art Styles —videogameartstyles.tumblr.comg beautiful. who said games all look alike? 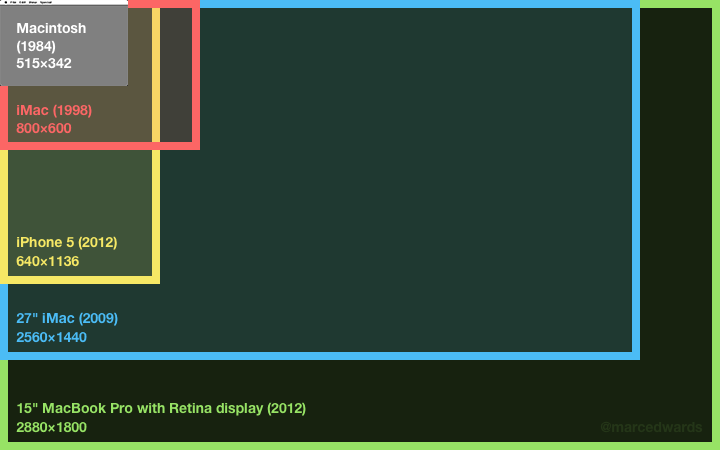 marcedwards Important Apple display sizes over the last 30 years: Macintosh vs iMac vs iPhone 5 vs 27” iMac vs 15” Retina MBP. @secretxergin ok lang. basta may personal demo kami ni @wilhansen_li :P jam lang nang jam! sana magkita tayo next year. StevenLevy Great news: @BillGates predicts no poor countries by 2035. Not so great: in 2004 he told me spam would be gone in a year. Samurai Flamenco. WTF am I watching. @richtuason haha sige. :) will be there! benadida Obama sending openly gay athletes to Sochi. Putin offering permanent asylum to Snowden. This new cold war is way more fun than the last one. DamosDaze Thank you for this @ternus: “New post: “Breaking Down Tech Privilege from the Inside” adversari.es/blog/2014/01/1…” You’re a hero from the future. @wilhansen_li Philippine market when? also can has hybrid? Hoefler & Frere-Jones going to court over ownership qz.com/167993/frere-j… makes me really sad, like seeing two friends fight. I love H&FJ! levi_io @_phi just concluded his introduction to budgetbadger.ph at #goodgovph! levi_io At the #goodgovph summit with @_phi and @syk0saje. Wish @_pords were here! Why Women Aren’t Welcome on the Internet—psmag.com/navigation/hea…w Fem usernames incurred 100 explicit/threatening msgs a day. Masculine: 3.7. Damn, new Pebble Steel: getpebble.com/steel — real strong itch to get this. Maybe I should just wait for the fabled iWatch. iH8sn0w Majority of issues people experience after jailbreaking are caused by cracked tweaks/AppSync (even after removing them). i0n1c No idea if this is fake or not, but I guess in Germany one would not pay a cent for this. @marionjames05 yup, I did. they give their regards. see you around again! 3D Mid-Air Acoustic Manipulation: hardware-360.com/three-dimensio… —or put simply, levitating objects using SOUND! standing waves are cool. Distributed Systems for Fun and Profit: book.mixu.net/distsys/ —free ebook. nice read on large-scale concurrent/distributed computing. jamaicanpatsy indiestatik.com/2014/01/01/ind… lot of stuff to look forward to! octopus city blues, that dragon cancer, rime, lioness and among the sleep are a few. wow such headline. many research theverge.com/2013/12/31/524… —nice article on the origins of Doge meme. top-notch@vergee reporting as usual. wow. @Freerunnering just wanted to thank you for SwipeSelection. I’ve used it since 1.0. If I had to live with only one tweak, this would be it. New Year’s resolution: 2880 x 1800 (actually relevant because I have a new display!) retina MBP ftw!